Inception (2010) currently has a user rating of 8.9 on the IMDB Web site, making it one of the highest-rated films in their comprehensive world database. 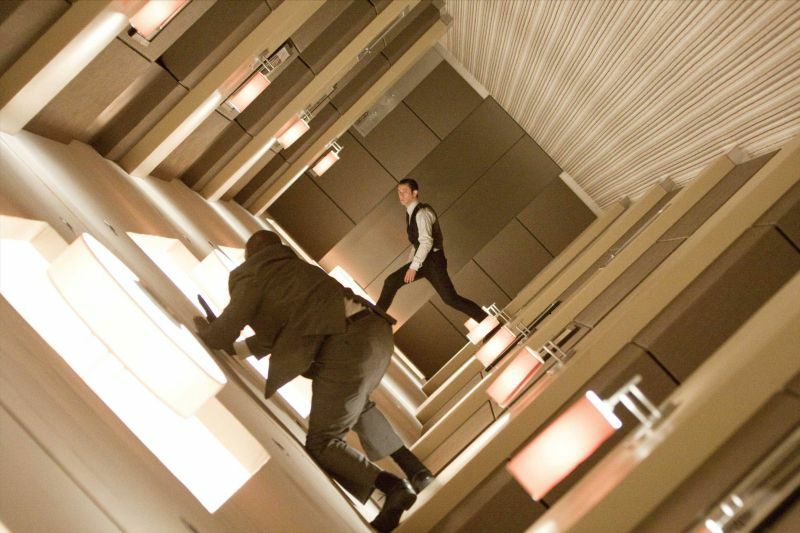 By that rec koning one could argue that Inception is one of the best (or at least most popular) films of all time. Writer-director Christopher Nolan was already known for his reality-warping screen thrillers Memento (2000), The Prestige (2006), and The Dark Knight (2008), but Inception was hailed by his fans as his greatest achievement. The sci-fi story of the film involves a high-tech “intellectual property” burglar, Cobb (Leonardo DiCaprio), who is skilled at stealing highly profitable ideas from people by invading their minds while they sleep. Early on we are shown situations where he can invade the dreams of other people and manipulate the dream so that he can grab what he wants; he can also go into a dream within a dream. This dream-within-a-dream scenario becomes the fundamental metaphor of the film. After a failed intellectual heist, though, Cobb is offered a job by his most recent intended corporate victim to do something different: not to steal an idea, but to implant an idea into a rival’s brain which will lead to big financial returns for the sponsor of that intellectual “inception”. This idea-insertion operation is thought to be impossible, according to the conventional wisdom of dream burglars, but Cobb thinks he can do it and agrees to the contract. He then goes about assembling a high-tech team to carry out the intended implantation maneuver. In order to accomplish the desired operation, he claims, they will need to go down three levels – to a dream within a dream within a dream. This may seem to be mentally mind-boggling, but actually the task of following the various dream penetrations in the rest of the film is relatively straightforward. The machinations of the dreamworks, however, are not straightforward, at all, although Nolan’s script blithely (and mindlessly) employs basically magical explanations whenever the script demands it. The vehicle for delivering these explanations to the viewer is for Cobb to recruit a young, innocent college girl, Ariadne, to serve as the dream “architect” for the team and for Cobb to explain things to her. She is told that since people can invade each other’s dreams, it means that dreams are essentially shared vehicles with multiple drivers. Whenever Ariadne sees something totally weird going on with the world, she is told, oh, that must be so-and-so’s dream “projection”. Each level of dreaming that one “descends” to (i.e. further descent into the dream-within-a-dream scenario) involves relative time distention by at least an order of magnitude – that is, what seems to take hours in the lower level only occupies minutes in the dream level immediately above it. Then we are told that the entire high-tech idea-implantation team assembled by Cobb and wandering around in the lower depths of dreamdom can magically ascend back to reality by synchronizing on some music that is collectively heard. Sounds easy, doesn’t it? Things get more complicated, though, because of Cobb’s own hangups – he is haunted by his own nightmares of his deceased wife, Mal, who occasionally enters into the shared dreamscape and wreaks havoc. This is apparently due to Cobb’s personal feelings of guilt concerning her death and not due to any inherent malevolence on Mal’s part, since Mal is generally presented as a sympathetic character. Anyway, because of various unforseen events, Cobb and some members of his team must descend further into even lower dream levels than originally planned (ultimately to the fifth level), and, of course, that means that they are plunging into unknown and even more dangerous territory. At the end of the film, in fact, there is a suggestion that the entire film, including the final shots, may still have been taking place at some unspecified dream level. That is, perhaps Cobb’s world of professional idea thievery is just another dream, and there are actually (at least) six dream levels covered in the film. While I recognize that suspension of disbelief is crucial to science fiction films (a number of which I do enjoy), the ad hoc and superficial, essentially magical, explanations in Inception don’t hold up. Claims that this film appeals to the imaginative intellect need to be buttressed by more than repeated references to ‘catharsis’ and having a character named “Ariadne”. I have remarked elsewhere about the folly of believing in "intellectual property" – that ideas are objective, material objects that can be stolen [1,2]. But I would be willing to set that objection aside for a fantasy film like this if there were something else in the story that tantalized the imagination. One potential topic that could have been taken up with some payoff is the issue of Mal’s (Cobb’s wife’s) autonomy. Is she an autonomous spiritual being who has returned from some external spiritual domain to enter into Cobb’s own dreams? Or is she just a fig ment of Cobb’s guilt-ridden imagination? It would have been interesting to highlight the contrast between (a) a materialistic interpretation of Mal’s presence (which could be held by Cobb, the professional and mechanical idea thief) as a figment of Cobb’s imagination and (b) the alternate idea that Mal’s presence actually does represent an encounter with the still-living spirit of the deceased Mal. But this potentially interesting issue, one that does come into play in Solaris (1972, 2002), was not pursued or examined here. Inception has many of the external earmarks of an Expressionist film, but I wouldn't classify it as such, because it doesn't convey the expressionistic aesthetic impression. There are other problems with Inception as well. 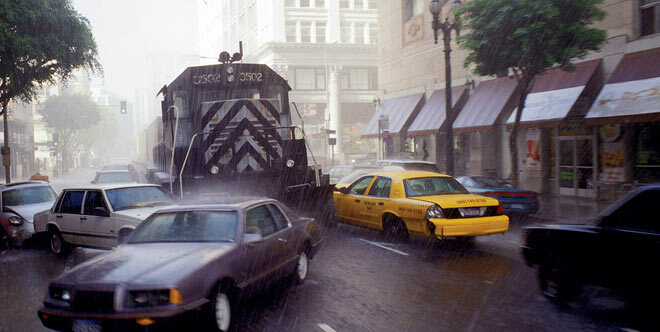 Throughout the film there are repeated violent encounters involving chase scenes with armed gunmen. These are all going on concurrently at several dream levels, with many people getting shot and killed, but there is little motivation for these scenes. Nolan is unable to build up any narrative motivation for these events, so they just seem to be pointless violence. It’s not even like playing an endless first-person shooter game (FPSG); instead, it’s like watching somebody else play an endless FPSG – the viewer feels little involvement in the action. The relentlessly pounding and one-dimensional background music by Hans Zimmer only makes things worse. The presentation and acting is confused by a mixture of dramatic genres. It is as if the actors and actresses are not on the same page as to what kind of movie they are in. The relationship between Mal and Cobb is presented as a serious and emotional dramatic encounter. But this theme, as I suggested above, is only left hanging. On the other hand, Cobb’s “mission impossible” team of dream-manipulation technicians plays it very tongue-in-cheek. – it all seems like a joke. And then Ariadne, Cobb’s dream landscape architect, is very much the innocent young college girl. So we have a confused dramatic mishmash of shootem-up violence, a dramatic love relationship, a cheeky heist movie, and a teenage coming-of-age story – and all going on at the same time. No wonder the actors seem confused (although DiCaprio, as Cobb, and Marion Cotillard, as Mal, do pretty well under the circumstances). Admittedly there are some dazzling graphical effects, such as a downtown city environment rolling up over itself like a carpet, entire cities gradually crumbling to pieces, locomotives roaring down the middle of city streets, and fistfights in zero-gravity (or sometimes gravity is present, but the gravitational axis is shifting). But these effects need an effective story to make them interesting. As it is, the effects (apart from the gravity-shifting environment) seem to be “out there” – just part of some weird landscape and not part of the immediate, interactive environment. The viewer’s attention is distracted (and by means of that distraction perhaps somewhat engaged) throughout the film by the task of having to keep track of exactly which dream level the film is operating on at the moment; and so one keeps on watching intently for the almost three hours of action. But that distraction is not enough to make it all worthwhile (even if video game addicts seem to find that kind of distraction sufficient for their needs). Although Inception is promoted as a mind-bending intellectual feast for the college crowd, it seems to be only sophomoric. See: "'RiP: A Remix Manifesto' - Bret Gaylor (2009)", The Film Sufi, http://www.filmsufi.com/2009/08/rip-remix-manifesto-brett-gaylor-2009.html. See: "'SiCKO' - Michael Moore (2007)", The Film Sufi, http://www.filmsufi.com/2010/02/sicko-michael-moore-2007.html.